Formula 1 boss Bernie Ecclestone has made an offer to buy the Nurburgring race circuit, according to an interview with two German publications. The track, which alternates with Hockenheim in hosting the German Grand Prix, is in administration after being burdened with debts equating to around 50 years' profit by local politicians. The 83-year-old said his move was aimed at keeping a Formula 1 race in Germany. "We made an offer and we now wait for it to be accepted," he said. "We believe we can do more than anyone else for the circuit. 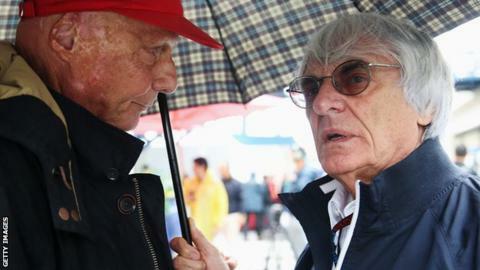 There could be a decision as early as in the coming weeks," added Ecclestone, in a joint interview with Handelsblatt and Wirtschaftswoche. An official for the administrators refused to speak directly about Ecclestone's bid, saying: "We do not comment on any specific bidders. But everybody who has an interesting offer is warmly welcome. "We're in the final stages of the process and want to conclude it in [the first financial quarter], so the new owner(s) can start the season in April." A German court has yet to decide whether Ecclestone must stand trial on bribery charges related to a $44m (£28m)payment to a German banker, Gerhard Gribkowsky. Gribkowsky was jailed for more than eight years in 2012 for offences including tax evasion and bribery.